Samsung launched the Galaxy S5, the company’s latest smartphone powered by the latest Exynos 5 Octa chip last week . 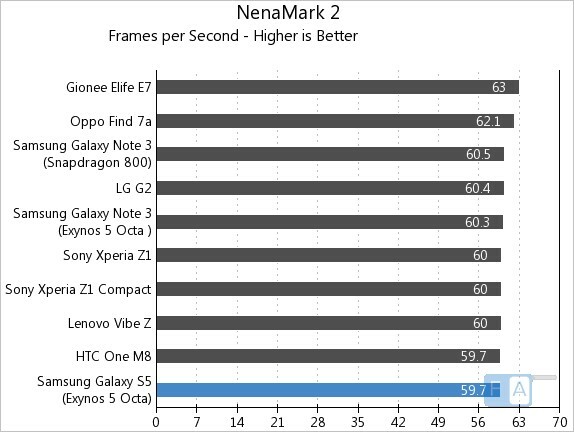 We already brought you the unboxing and the photo gallery of the device, here we have the benchmarks of the smartphone. It is powered by an Octa-Core Exynos 5422 processor based on ARM big.LITTLE architecture and 28nm High K Metal Gate Process technology, similar to the previous Exynos 5 chips. It has four ARM cortex A15 cores clocked at 1.9 GHz each and four ARM Cortex A7 cores clocked at 1.3 GHz each and has a ARM Mali T628 MP6 GPU. It also has True Octa-Core or Heterogeneous Multi-Processing that can run combination of up to eight cores to provide optimum performance. It has a 5.1-inch (1920 x 1080 pixels) IPS display, 2GB RAM and runs on Android 4.4 (KitKat) OS. 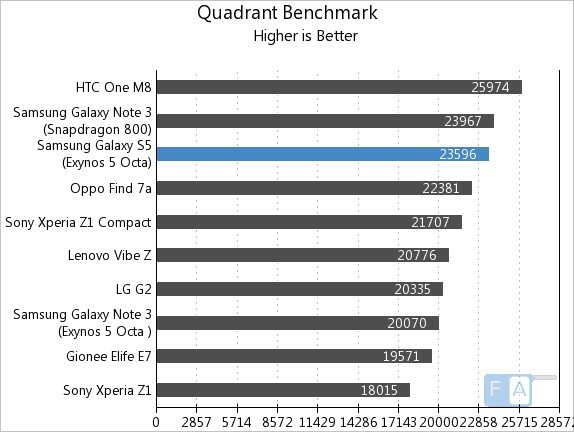 Let’s check out the performance of the smartphone in a range of synthetic benchmark tests. It scored 23596 points in the Quadrant benchmark. It scored 38154 points in the AnTuTu 4. 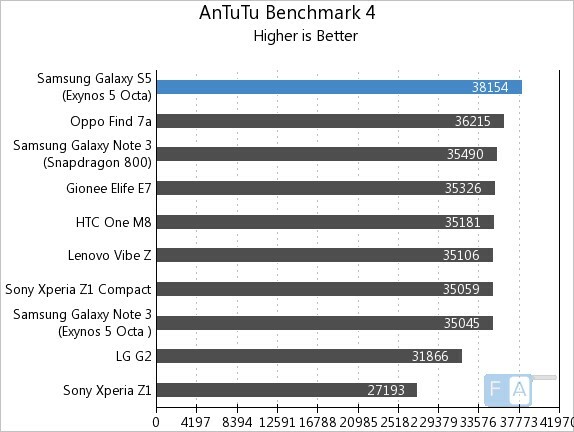 In the AnTuTu Benchmark X it scored around 24000. 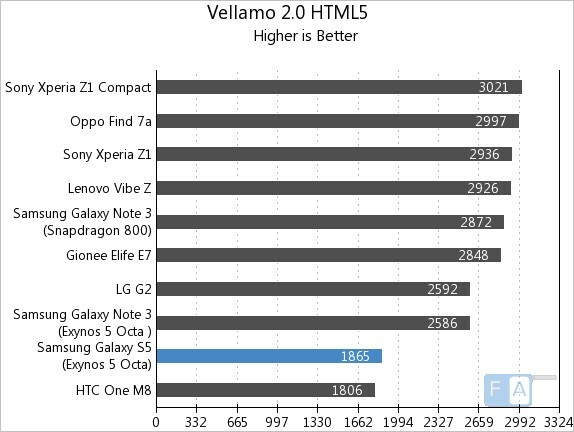 It managed to score just 1865 points in the Vellamo 2 HTML5 benchmark. 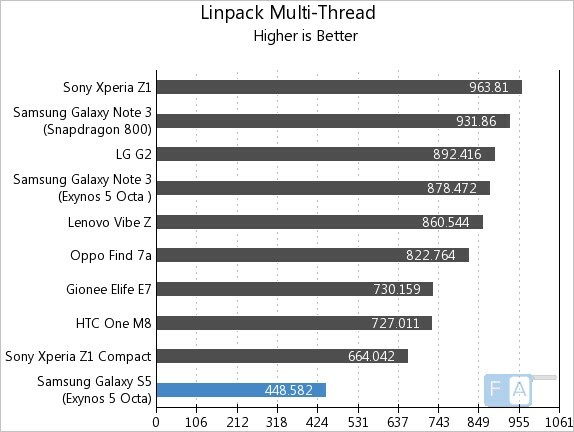 Note sure why the scores are low compared to the Octa-Core Note 3. 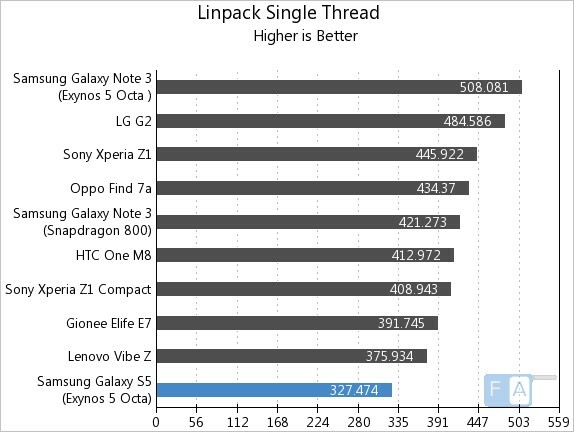 May be the benchmark might not be optimized for the latest Exynos chip. 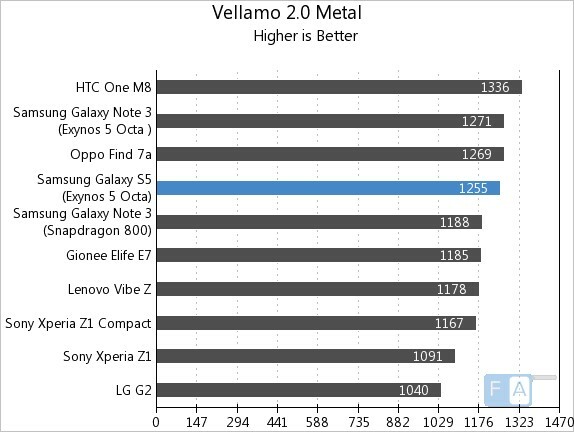 It scored 1255 points in the Vellamo 2 Metal, CPU subsystem performance test and lies behind the Note 3 Exynos variant. It managed to clock just 327.4 MFLOPS in the Linpack single thread benchmark. Again, it managed to clock around 448.582 MFLOPS in the Linpack multi-thread benchmark. It managed to clock 59.7 fps in the NenaMark 2. 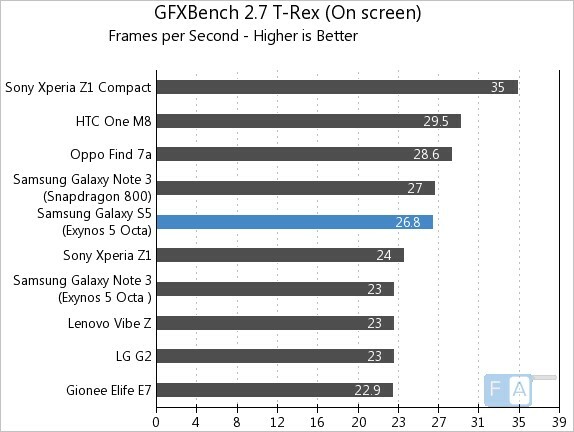 It managed to clock 26.8 fps in the GFXBench 2.7 T-Rex Onscreen benchmark and lies just behind the Snapdragon 800-powered Note 3. 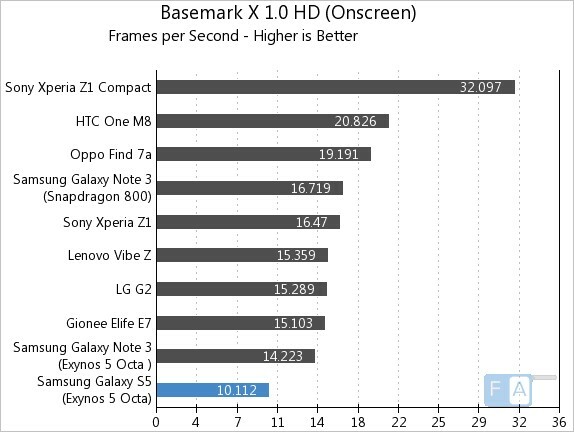 It managed to clock around 10.1 fps in the Basemark X 1.0 Onscreen benchmark. 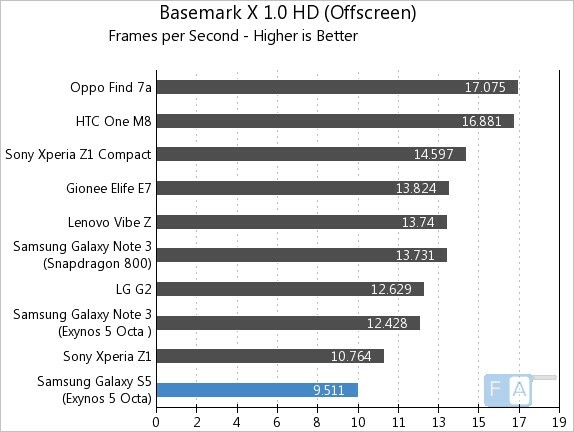 It clocked around 9.5 fps in the Basemark X 1.0 HD Offscreen benchmark. 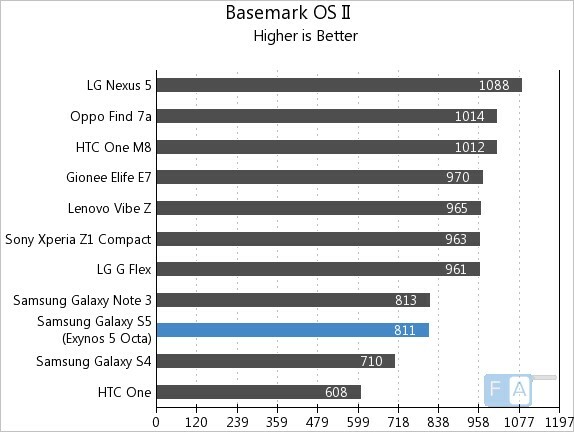 It managed to score 811 points in the Basemark OS II and lies ahead of Exynos-powered Note 3. 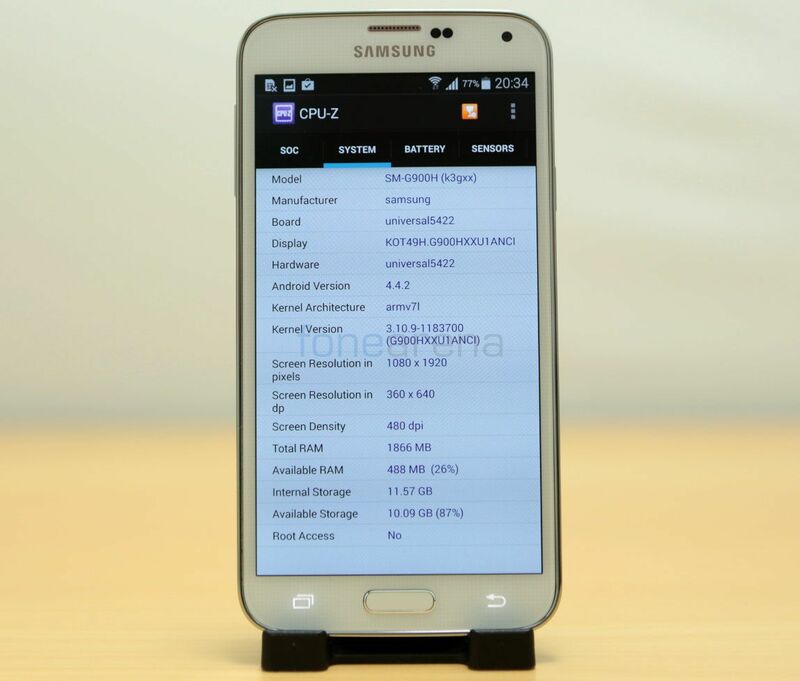 We will be bring you the benchmarks of the Snapdragon 801 variant of the Samsung Galaxy S5 soon.